Automotive Air Filters Market size was above USD 4 billion in 2015 and expects gains at over 7%. 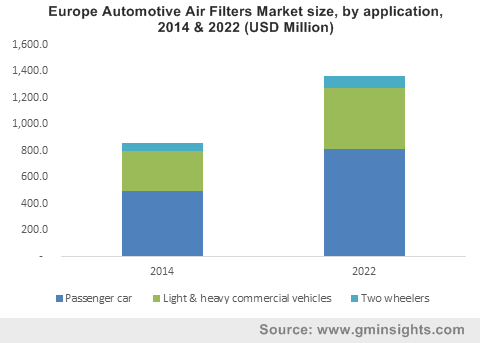 Positive outlook towards growth in vehicle sales should boost automotive air filters market size. Passenger cars and two-wheelers are widely used and have witnessed increase in sales since past few years. In 2014, passenger automotive demand was over 55 million units 2014 and may surpass 75 million units at the end of 2018, with gains at above 4%. Growing awareness about health hazards are foreseen to increase the growth and expand automotive air filters market size. CCC and EPA create awareness among vehicle owners about the health consequences resulted from car engine systems due to absence of proper filtration and ventilation system installations. This may promote product demand and secure personal health. Cabin air filter market size should surpass USD 3.5 billion revenue by 2022. Increase in vehicle production along with growth in traffic levels negatively affect air pollution which may reach the vehicle cabin through ventilation or air conditioning system. These products are to be replaced every two years depending on the vehicle usage in order to reduce pollutants and provide optimal comfort. Intake automotive air filters market size expect significant gain of around 7.5%. They are majorly used to protect and restrict dust elements entrance through burning engines which can harm cylinders and piston rings. Automotive air filters market size from passenger car applications should register over USD 3.5 billion revenue by 2022. Rise in disposable income, increase in tourist transport demand and growing consumer awareness towards health concerns should drive industry growth. Automotive air filters market size from heavy & light commercial vehicle applications may generate over USD 2.5 billion by 2022. Rising trade & commerce industry and transportation of commercial goods via roadways should encourage industry growth. Automotive aftermarket industry should generate over USD 1.8 billion by 2022. Government norms and increasing awareness to sustain the engine life and cabin has led to high demand for automotive air filters market size. OEM should witness significant gain of above 7%. Highly unorganized market in China and India threats the key OEM automotive air filters when price and quality are equated. Raw materials such as polypropylene nonwoven fabrics, fiberglass, pleated papers and ceramics papers may witness supply demand shortage as these are used by different other industrial applications. This factor may affect profitability and pressurize automotive air filters market price trend. Introduction of electric vehicle may restrict industry growth. Asia Pacific dominated by Japan, India and China automotive air filters market size, should surpass 3.5 billion revenue by 2022. Increase in automobile production has led to high product demand. Foreign automobile manufacturing companies invest in APAC due to availability of low labour wages and favourable government norms to promote FDI. These products are very common in Japan due to its high technological innovation in transportation industry. North America, dominated by U.S. automotive air filters market size generated 850 million revenue in 2015. Presence of large vehicle owner base along with strict government norms to curb pollution levels to reduce carbon emissions should boost regional industry growth. Companies operating in the global automotive air filters market are Cummins Inc., Ahlstrom Corporation, Denso Corporation, Neenah Paper Inc., Lydall Inc., Roki Co., K&N Engineering Inc., Parker Hannifin Corp., Toyota Boshoku Corporation, Mahle GmbH, Robert Bosch GmbH, Valeo S.A, Global filters, Simplex Corporation, Donaldson Company Inc., and Freudenberg & Co. The industry is fragmented with top five automotive air filters industry participants constituting less the 45% of the market. This industry may witness mergers & acquisitions taking place which can lead to consolidation. In February 2014, Mann+Hummel Group acquired Vokes Air, a Sweden based company manufacturing air filtration system from The Riverside Company which increases the production capacity of automotive air filters. In December 2016, Parker Hannifin Corp. agreed to acquire Clarcor Inc. for about USD 3.4 billion to strengthen the industrial and automotive air filter portfolio. Automotive air filters restrict dirt particles and other harmful substances from entering the engine or fuel system. It enhances quality performance and increases longevity of the vehicles. The cabin air filter is made up of paper and located in air intake from outside for the passenger compartment of the vehicle. The shape varies from rectangular to a unique shape that fit the available space of outside air intake. Regulations related emission control to reduce air pollution globally is a major impact on automotive air filter market size. Europe has increased the use of textiles in automotive filters due to diesel and petrol norms regulating the light and heavy vehicles.